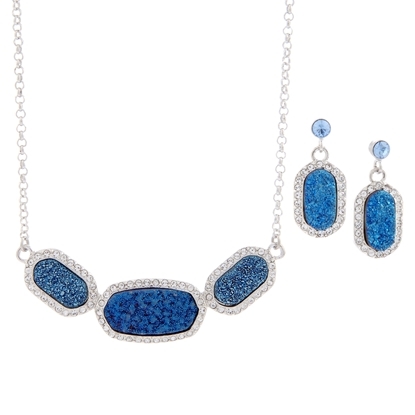 "Feeling Blue?".. 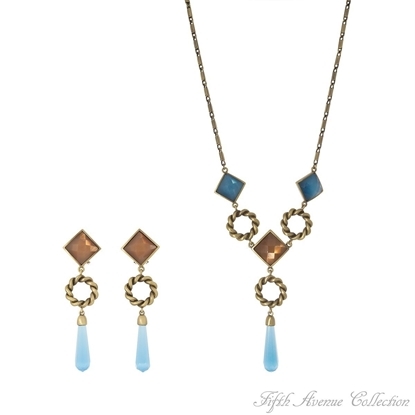 then you're on track to step out in style wearing this fabulous matching wire neckpiece and earring set. 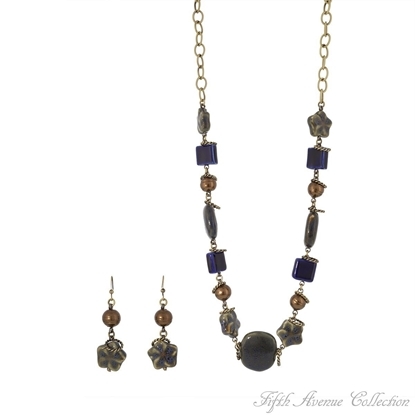 Intriguing globes set with Swarovski's sparkling navy blue crystals, drop from delicate open looped chain finished in hematite to create earrings that are in a class all of their own.Drop earrings with 14k posts and 16” neckpiece with 2” extension, set. 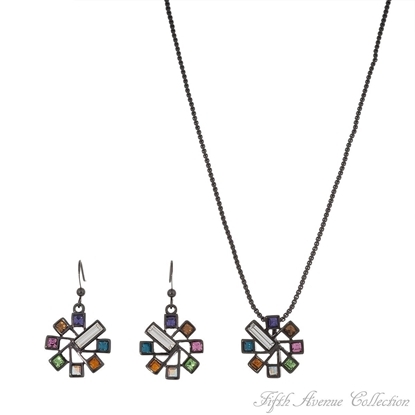 You'll feel like a kid again when you accessorize with Fifth Avenue Collection's "Ferris Wheel" jewellery, featuring colorful Swarovski crystal set in a black hematite finish.Earrings with sterling silver hooks or adjustable clips and 17" neckpiece with 2" extension, setNickel and lead free. 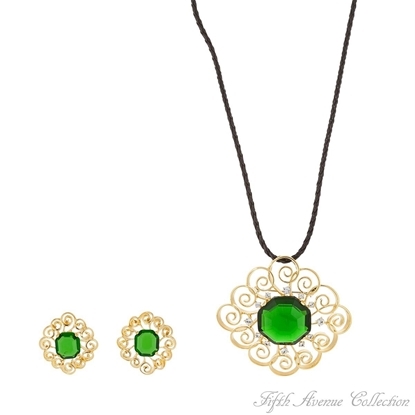 A magnificent emerald green Swarovski crystal is the main attraction of this gorgeous neckpiece. A black rolled cord finishes its trendy look. 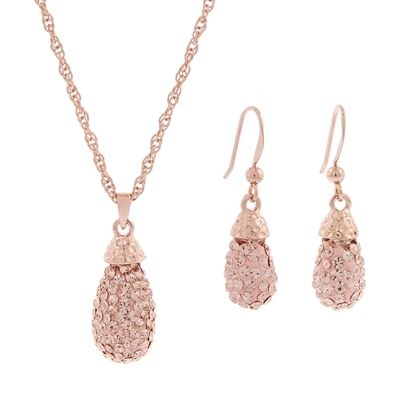 The matching earrings are brilliant set amongst bold swirls of gleaming gold. 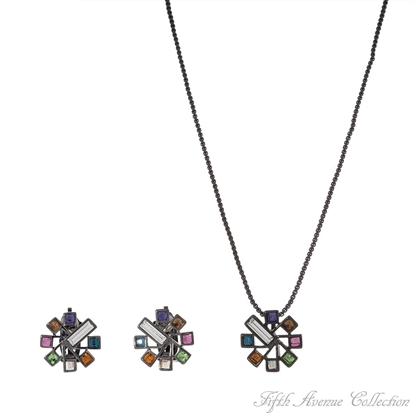 Earrings with 14K posts or adjustable clips and 16” neckpiece with 2” extension, set.May also be worn as a pin.Nickel and lead free. 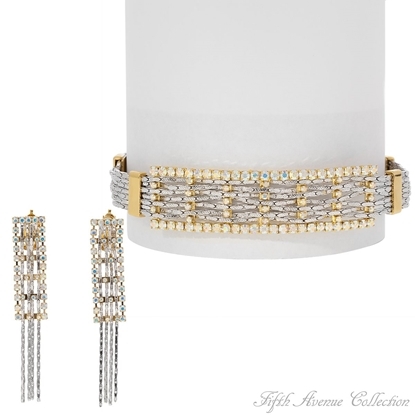 A classic cylinder design surrounded in Swarovski’s finest rounds and beautiful baguettes delicately dangles from a fine rope chain. 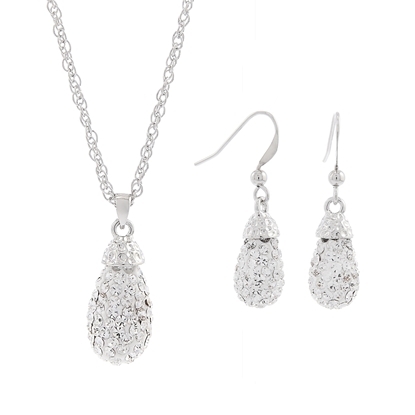 Available in your choice of rich rhodium or gleaming gold. Sterling silver hook earrings. 16" Neckpiece with 2" extensionNickel and Lead free. 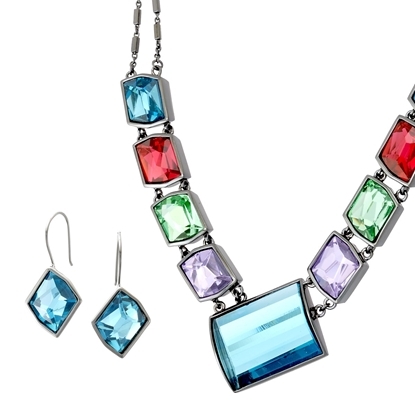 The first thing that hits you is its shimmering color – striking, vibrant and full of life. It only takes a single row of Swarovski’s peridot beads to create this simple yet stunningly beautiful jewellery that we have named “Sparkling Ivy”. 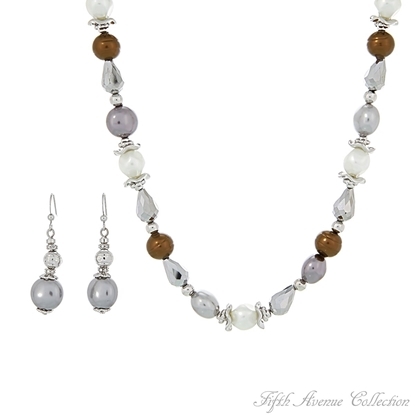 Wear it for dozens of compliments!Earrings with 14K posts and 16” neckpiece with 2” extension, setNickel and lead free. 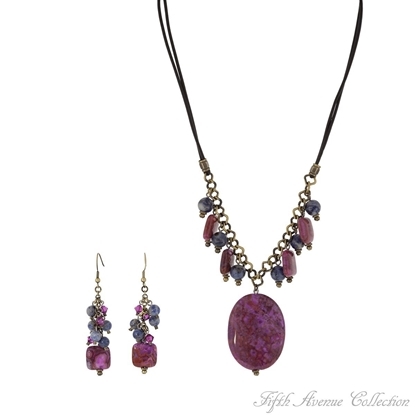 Shocking pink agate and Lapis blue beads bring uncommon beauty and unconventional glamour to this stunning set, that fairly takes your breath away as it drops from a popular rolled rope and gold antiqued chain. 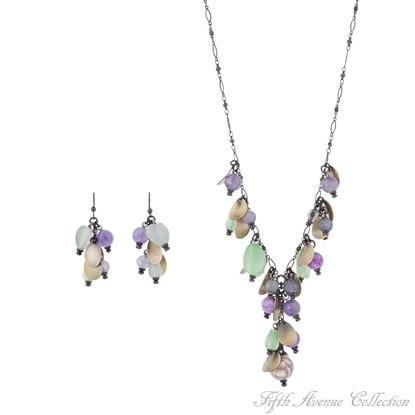 The delightful hook earrings complete the look of this breath taking jewelry. Sterling silver hook earrings. 16" Neckpiece with 2" extension.Nickel and Lead free.